boys adidas t shirt 13 14 White With Black Logo. Condition is Used. Dispatched with Royal Mail 2nd Class. 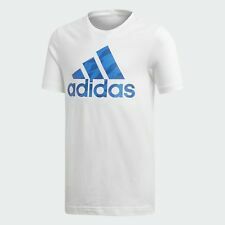 Boys Blue Adidas t-shirts age 7 to 8 years. Condition is Used. Like New. Dispatched with Royal Mail 2nd Class. BOYS SHORT SLEEVE CREW NECK T SHIRT.AGE 10-12 YEARS. WITH NAVY PANEL AT TOP. SMALL LOGO ON FRONT OF CHEST. 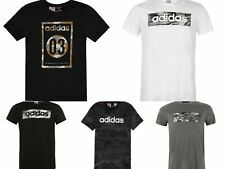 Boys Adidas Originals Logo T Shirt. Black. Age 11-12 Years. Boys Adidas T Shirt white with black & green logo. Age 13/14 years. Worn and in good condition however does have couple of small very faint marks on front, can’t really notice but thought best to mention. I’m down sizing so having a huge clear out and will be adding more items over the next few weeks when I get some spare time so please take a look at my other items. Pay pal only. Postage includes packaging. I do combine postage for 2 or more items purchased, in these cases please wait for revised invoice before paying. Item is post only and not available for collection. Adidas Boys age 9-10yrs. Green T-shirt with printed logo. Good used condition. GENUINE ADIDAS STAR WARS BOYS JERSEY T SHIRT. SIZE XL, AGE 9-10 YEARS. Adidas Originals. In immaculate condition. Large Adidas Originals printed logo. Age 4 Years. A BOYS / TEENAGER'S BLACK COTTON LOGO T-SHIRT BY ADIDAS. A black t-shirt, with a black and white Adidas logo graphic on the front. Machine washable . Age ~ 13-14 years. Pit to waistline ~ 17" / 43 cm's. Boys over the head hoodie. --- adidas Hacked Roots T Shirt Junior Boys --------------------------------------- This adidas Hacked Roots T Shirt is crafted with short sleeves and a crew neck. It features a ribbed trim for a comfortable fit and is a lightweight construction. This t shirt is designed with a printed logo and is complete with adidas branding.